Shop 'n Save sold 19 stores and closed 16 last year in the St. Louis region. Pictured is one of three stores shuttered in north county. Most city and suburban dwellers take the convenience of a local grocery store for granted. But many residents of Spanish Lake don’t have that luxury any more. When three nearby Shop ‘n Save stores closed in November, it left shoppers fewer options and created what the USDA classifies as a food desert. Until recently, Spanish Lake residents had several options for grocery shopping. Three Shop ‘n Save stores located along the western edge of the community provided easy access to fresh, affordable produce. In November, all three stores closed when parent company Supervalu decided to quit retail and focus exclusively on its wholesale business. There is Metro bus service in the area, but it’s limited. According to a spokesman for Bi-State Development, the Metro Reimagined initiative could bring more frequent service and new routes to Spanish Lake, if the plan is approved later this year. Driving to the Shop ‘n Save stores in search of bargains was not difficult for Gloria McGill, a retired Spanish Lake resident. With the loss of those stores, she is concerned about the lack of competition and choices. She also is worried about her neighbors. Spanish Lake residents share their reactions to losing three grocery stores. According to USDA parameters, a large section of northeast St. Louis County now qualifies as a food desert as a result of the access to food. There is one full-service supermarket in Spanish Lake: the Schnucks at Larimore and Bellefontaine roads. Spanish Lake’s main thoroughfare, Bellefontaine Road, is lined with small, half-empty strip malls, a few gas stations and a couple of fast-food outlets. Family Dollar or Dollar General stores dominate; It seems there is at least one on every block. The lack of access to fresh, healthy produce and other food products defines a food desert. The U.S. Department of Agriculture’s term for these areas is “low-income low-access” (LILA): when a high percentage of a population with low income lives one half mile or one mile from a supermarket. According to the latest data published by the USDA in 2015, 56 percent of St. Louis City residents are living in LILA areas. For the larger metro region, 27 percent live in LILA areas. “The closing of the three Shop’n Save stores inevitably has increased the number of residents living in LILA areas,” said Melissa Vatterott, Food and Farm director, Missouri Coalition for the Environment. 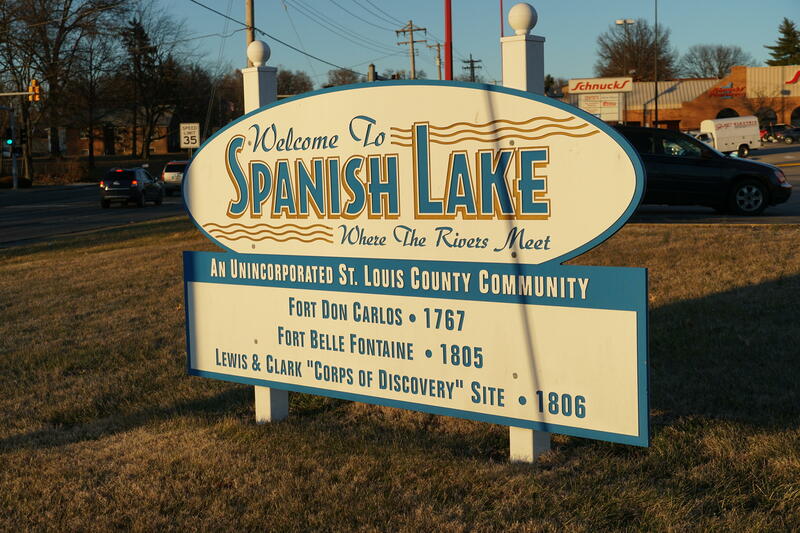 Vatterott added that 78 percent of Spanish Lake residents are black, and this latest grocery-store loss continues to widen the racial disparity in food access in north St. Louis County. One short-term solution is to recruit the services of St. Louis MetroMarket, a nonprofit farmers’ market that sells fresh produce from a converted city bus to residents living in food deserts. MetroMarket’s season runs from April through November. In the meantime, the Spanish Lake Community Development Corporation is looking for long-term solutions to challenges like food access. The group’s chair, Lottie Wade, said many residents who have witnessed the loss of businesses and families are worried about the area’s future. In an unincorporated community without its own municipal officials, it’s up to Wade and other volunteers to lobby for the future of Spanish Lake and give residents a reason to remain and call it home. The Neighbors' Market grocery store opened its doors in October, filling an unmet need in East St. Louis. The full-service grocery store has fresh produce, healthy food options and ready-to-go, prepared meals like sandwiches, soups and salads. The market has even partnered with local businesses to sell their products. The Fit and Food Connection now has a permanent location in north St. Louis County to offer food and exercise options for low-income individuals and families. The non-profit organization is partnering with Believers Temple, a church in the Castle Point area. The partnership will use the building’s fitness center and kitchen to teach members healthy eating habits and preparation, workout routines and to offer healthy food options.